How do you get a man excited to eat a salad? 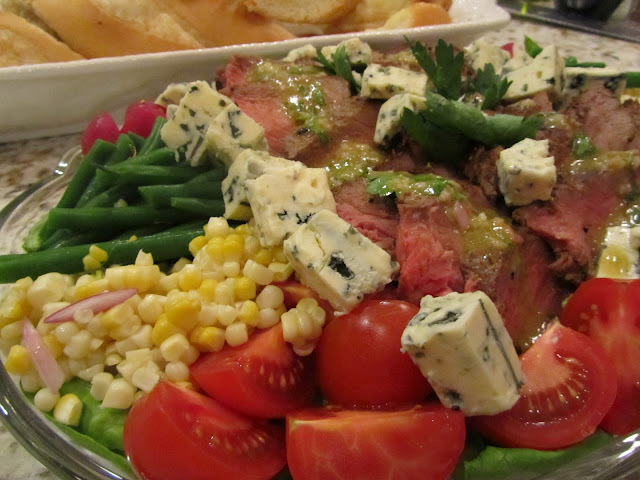 Why make it a Porterhouse Steak Salad of course. 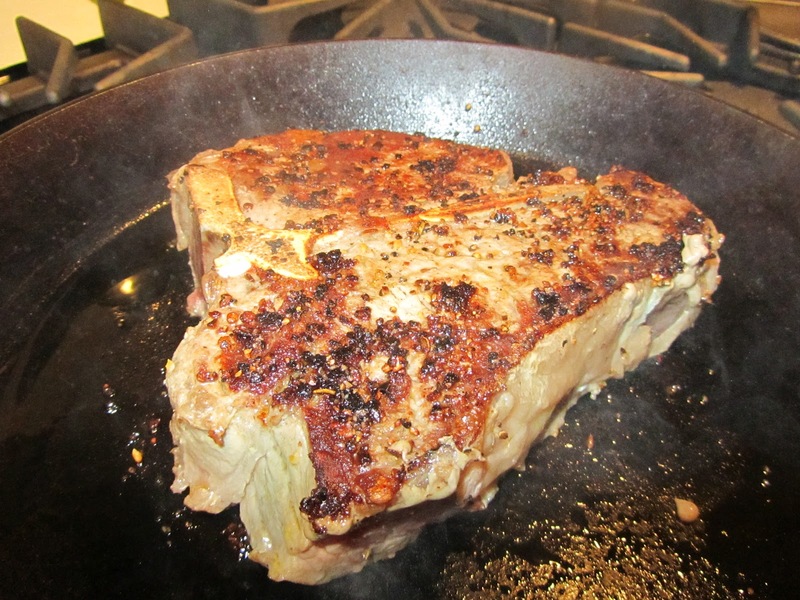 There’s just something so masculine about a Porterhouse. It ain’t no Petite Filet. The Porterhouse is like a T-bone steak on steroids, it contains both the New York Strip steak (the larger side) and the Tenderloin (the smaller side). I used a skillet to cook my steak, so I needed to pre-heat the oven to 400; I also put a sheet pan in the oven to get hot. and then plunge the beans into a bowl of ice water to keep the beans crisp and the color bright. 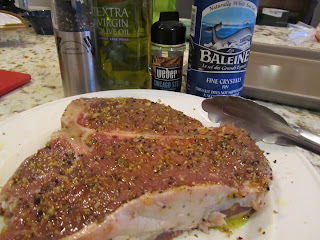 Next I coat the steak with olive oil, and season liberally with Chicago Steak Seasoning, salt and pepper. 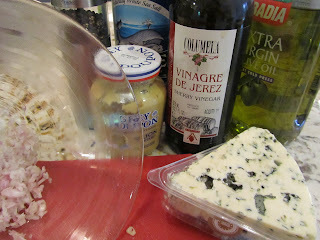 I make the vinaigrette which is tangy and mustardy, the perfect balance with the steak and blue cheese. The sherry vinegar has a nice depth of flavor, it’s not just acidy. I really would recommend buying sherry vinegar if you are going to the supermarket, but if you don’t have it you can use red wine vinegar. I did my steak in a skillet, because (busted) I don’t have a grill at this time and quite frankly it’s so much easier and quicker for me to cook the steak inside. Also it is dang hot here in South Florida, so standing at an even hotter grill is just…well…it’s hot. I also like the carmelization that comes from the skillet. I cooked the steak about three minutes on each side over medium high heat. 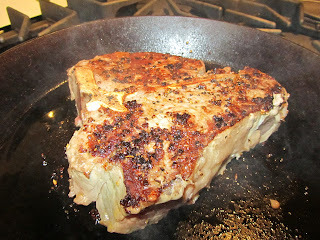 Be sure the pan is good and hot before putting the steak in the pan, or your steak will not caramelize. Be sure and brown the sides too. My skillet has a plastic handle, so I don’t put it in the oven. I put a sheet pan in the oven when I turned the oven on to 400 degrees, so both the oven and the sheet pan are pre-heated. I finished cooking the steak in the oven for 5 minutes. Let the meat rest at least 5 minutes. I let it rest while I assembled the salad. 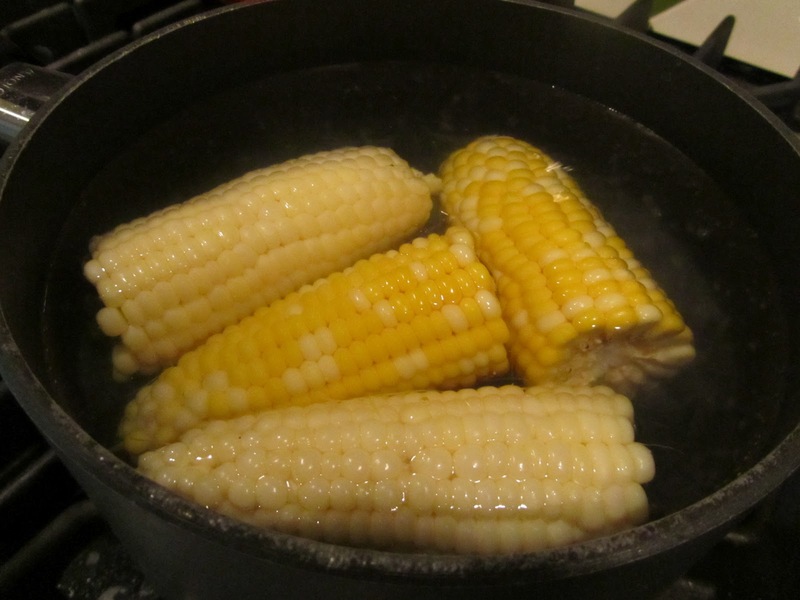 While the steak is cooking I cut the corn off the cob, and prep the rest of the vegetables. I put the lettuce over the whole platter, then the vegetables around the perimeter of the platter. 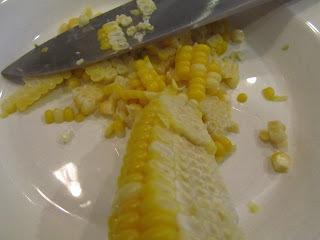 I like to put little piles of each vegetable so that my guests can take what they like. 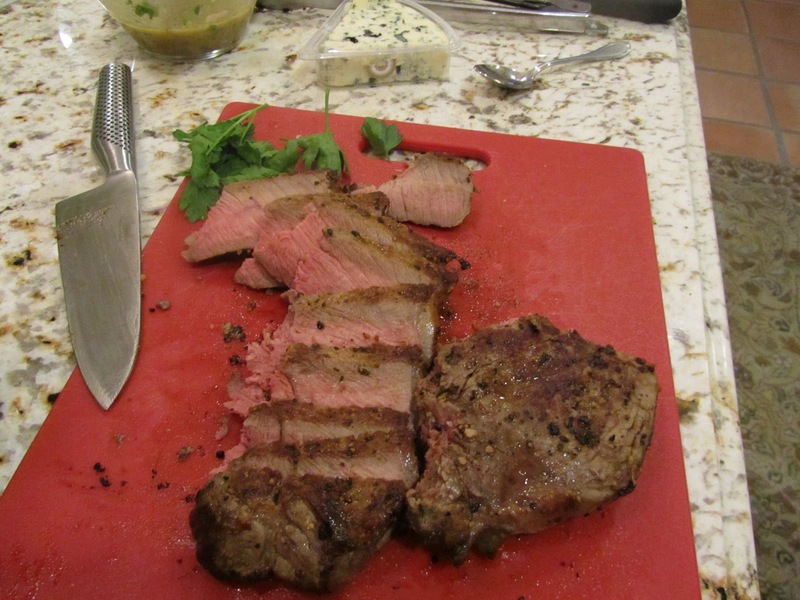 Slice the steak and place it in the middle of the salad, pour any juices over the steak. Put the blue cheese beside the steak. Top the steak with a little of the vinaigrette. I served this bold, not girly at all, salad with the remaining vinaigrette, and toasted garlic bread. 1. If you will be using a skillet to cook your steak, then you will need to pre-heat the oven to 400 degrees. 2. Coat the steak with olive oil and season both sides of the steak liberally with steak seasoning, salt and pepper. Set to the side. 3. Make the vinaigrette, in a small bowl add the shallots, mustard, salt, pepper and vinegar, stir with a whisk. 4. Slowly drizzle olive oil into the mixture while whisking. 5. Stir the chopped parsley into the vinaigrette. Set aside. 6. 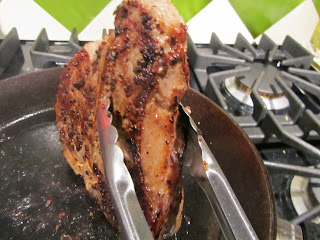 Either grill the steak, or heat a heavy skillet over medium high (if using the skillet pre heat oven to 400 degrees). Cook the steak in the skillet about 3 minutes on each side, so that there is a nice caramel brown color. 7. 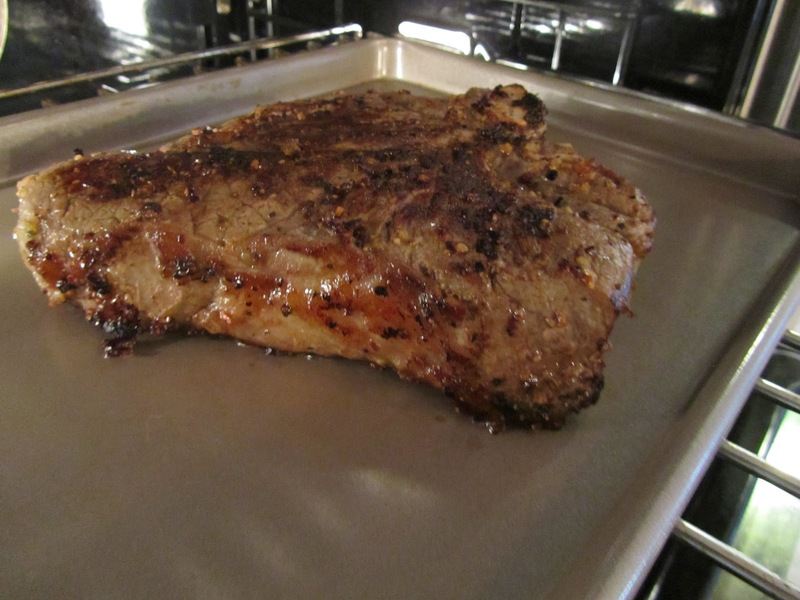 Finish the steak in the oven for 5 to 7 minutes until the steak is medium rare to medium. Let the steak rest at least 5 minutes. 8. 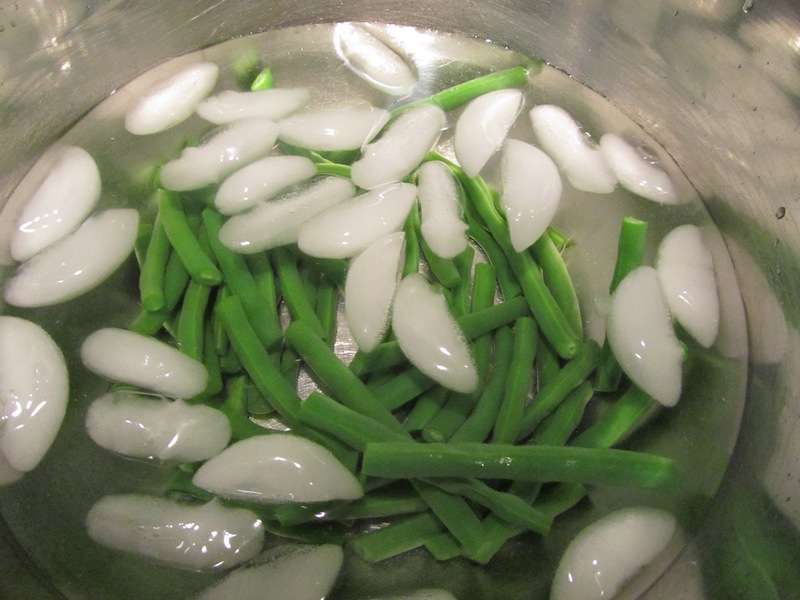 Place the lettuce over a platter; put the vegetables around the perimeter of the platter. 9. Slice the steak and lay over the lettuce in the center of the platter, pour any juices over the steak. 10. Top the steak with blue cheese and a little of the vinaigrette. 11. 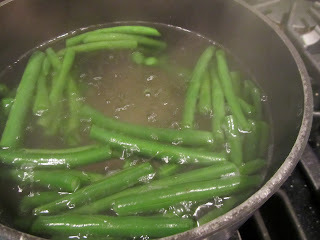 Serve with the remaining vinaigrette and a loaf of good crusty bread. This is MOUTHWATERING!! Everything is so fresh and the steak is cooked to perfection! This sounds like my kind of salad, and that dressing is calling my name!